With more and more riders adopting the single-ring lifestyle, more and more front shifters are being evicted from their residences, leaving vacancies on the once occupied handlebars. KS took notice of this prime real estate and wasted no time in claiming it. Enter the Southpaw remote. As the new kid on the block€¦ or bar, the Southpaw is an under-the-bar dropper post remote that's specifically designed for bikes running a 1x drivetrain. The remote features an innovative split clamp that allows a 4-axis of adjustment, providing perfect ergonomics and a natural feel. To put it plainly, adjusting seat height is now as easy as shifting your front derailleur once was! So, I realize that the product was just unveiled and there's going to be some bugs, but there were no installation instructions included. I found that when I was tightening the clamp to spec, it wouldn't hold tight enough when pressing the lever causing it to slip on the bar. Not good. I found an old rubber shim from a cyclometer I used years ago, fit it in between the clamp and the bar and problem solved. KS should include a rubber shim or two as is commonplace with lights and cyclometers. I installed this lever with friction paste onto carbon bars. Even with the paste it slips on the bars at 5nm under normal operation. I fear for my bars torquing any tighter. The action isn't all that impressive either, and the throw is very long. I don't recommend it. The spilt clamp design has zero staying power on carbon bars. You can clamp down until yoy literally crush the bar, and this lever will still move around. KS started to inclue "carbon prep" tape as a solution, which does jack squat as the tape just peels away beteen clamp and bar. If you've broken your stock lever or dislike it, I suggest buying the Race Face Turbine remote for just 10-15 dollars more, it's muct better done. This lever works great for my application. It installed easily on an Easton EC90 bar. It has zero movement on the bar and I did not use friction paste. It is extremely easy to activate and is much more ergonomic than the original KS thumb remote. I think it's a great product but it should be less expensive. Just buy it. This works so much better than the wonky lever that comes with the KS droppers. I was always fumbling for the tiny lever that sat on top of the bar. This sits right where the shifter used to go and is so natural to use. If you installed your dropper post yourself, you can install this. Honestly, one of the most useful purchases I've made for my bike. A must have for 1X setup! Can't imagine not having this now that I've used it. I first ordered one for my Girlfriend's Remedy because the stock KS I30 has a lot of resistance in the remote. The Southpaw gives a mechanical advantage and is more ergonomic to use. I immediately ordered one for my bike. Effortless to use on the KS i900. It was harder to mount on my carbon bars but if you have carbon bars, you're probably used to slippage issues. I prefer to trim Gorilla tape and use that on the surface of carbon bars to minimize slippage. KS already has a great lever when compared to many others. This is even better. Highly adjustable position. Love this as an alternative to the plastic lever that came with my KS LEV (the one I kept breaking). Due to the way this clamps onto the device, you can almost infinitely adjust position, rotation, reach, etc. Works great. Much better than the cheap plastic one the dp came with. Cleans up the bars and has a good set of adjustments. Cheaper would be nice, upgraded when I broke the stock remote. Some people complain about it moving on the bar but they aren't setting the torque correctly or don't have the clear tape under it correctly. I've had mine spin but only when I crashed and smashed the lever off a tree. It's been great for me and can be easily modified to work with posts that place the nub in the post instead of the lever. The stock lever doesn't cut it .. I bought this with my ks eten droper post. A must upgrade. way better and very nice quality. Used this lever to replace the plastic one that came with x fusion manic dropper post. Much better action and smoothness. This new generation of KS southpaw remote with the hinged clamp works well. You have great adjustment being able to rotate the entire clamp AND being able to rotate the lever assembly itself within the clamp. This gives you the ability to just fine tune the angle you push the lever at without moving where it sits on the bar. It's not as long as other shift lever style remotes, but it's plenty long enough to provide more than enough leverage to operate the dropper with ease. Huge improvement over the stock KS remotes and clean looks to boot. It's cheaper than all the aftermarket dropper remote options, which makes this a no-brainer for any KS owner. This is a great dropper remote. Lots of adjustment to allow you to get the right location. The quality is very good. I would highly recommend. They should ship the dropper with that, or a least give that option when you buy it. I replaced the original bat style remote that came with me Xfusion dropper with this style. Works much better for me and looks nicer also. Mach 6. The Kindshox dropper is the best on the market currently. Have not had any problems with my last two. This is an awsome remote lever. I use it for dropper post Looks good. Easy install. Great price. Best bang for your bucks! This product was perfect in function and fit. It was exactly what I was looking for in a dropper post lever. Feels like the shift lever it replaced so it felt natural. Very easy to install and use. 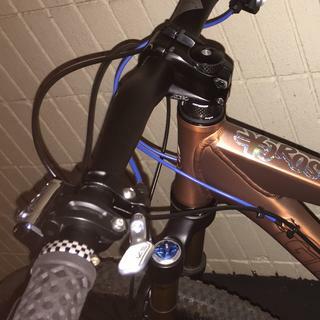 I switched from the old KS button that was integrated in the ODI grip ring to this hinged one after having tried and loved a similar Rockshox button on a rental bike. I love it! Easy installation, much more ergonomic than my tiny old button, and no issues at all with it staying in place on carbon bars. 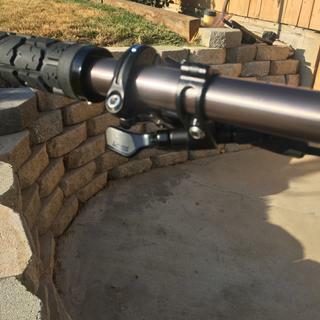 I did have to use the built-in barrel adjuster to adjust it correctly, especially important since there's no built-in spring in the lever action and it'll flop around a little without the seatpost's spring taking up all the slack. One other note, the clamp ends up a little away (i.e. inboard) from my XT brake lever to put the button in the same position as my right XT shifter. Not a problem for me, just something to keep in mind when installing. This is an awesome remote for my seatpost dropper for the price. It has been working flawlessly so far. It is very easy to get to and really much more comfortable than the stock remote. My buddy told me this lever will allow me to really keep my hand where it should be while reaching to drop my seat in technical. This lever with the KS LEV dropper is a winning combo! Ergonomically sound, and really allows quick or slow dropping of seatpost. Easy installation and the newer style clamp woks great, Makes it easy to modulate the seat post from slow to quick movement while keeping your hands on the handlebars. Definitely recommend. Installed this on a cube stereo, it works great. Built just like the fox transfer remote that I have on my other bike. I broke the stock lever on my eTen while installing it and rode with it jerry rigged for a couple years. This metal version is such a huge improvement over the plastic one in both durability but also function and ergonomics. Pscyhed to have it installed. My 2017 Diamondback Release 2 did not come with KS Southpaw standard. This was my first upgrade and well worth it. Using my dropper is a no-brainier now and ergonomically much better than the standard lever. I love the all black look versus the chrome look. Much more solid and convenient than standard KS remote and a RaceFace turbine that I used. This dropper post switch installed in a second super easy actually my cables run cleaner now. Now the switch works perfectly very intuitive and easy to use. Don't cheat yourself, treat yourself! This remote works great with my Ks Lev integra it doesn’t slip on the handle bar and is very reliable and easy to instal. I think the south paw remote works better than my Specialized command post remote. It's not too expensive and it works very well. Set up is very simple. If your using a 1 by gearing set up, it's a perfect fit. Perfect addition to and KS dropper. It is a great product. Works very well with KS dropper posts. Very adjustable. So much better than standard lever that comes stock. Pretty much required for me as long as you are on a x1 system with room to spare on the left side of the bars. This lever is sweet!!! KS always makes great products!!! Designed to be mounted on left handle bars, but I flipped over and mounted on right. Works great. This should come as the out-of-the-box trigger. Much easier to operate and easier to get closer to your fingers, simplifiying operation. Very easy to install and setup to just the right position. The handlebar clamp previously was a prob,em. With the new clamp, this makes for a really nice lever. The clamp and lever are actually separate pieces so you can infinitely adjust lever position. The clamp holds without any slippage. The throw is slightly long but within a week, my brain got used to the action and throw. I love it. Great price for a really good remote lever. Do not have to change your grip to activate the lever. Works better than the switch that comes with the dropper post. will this work with a Thomson elite external routed dropper? What type of housing and cable do I need with this? BEST ANSWER: This uses standard shift cable and shift housing. But it will only work on posts where the cable runs FROM the lever to the post (eg KS, Command Post, 9Point8). Beware though, several posts currently have BACKWARD routed cables where the cable runs TO the lever from the post (eg Thompson & Gravity Dropper). These will not work with the SouthPaw. Thomson droppers terminate and clamp at the post, not the lever. At least my externally routed does... They all use the same Thomson lever. 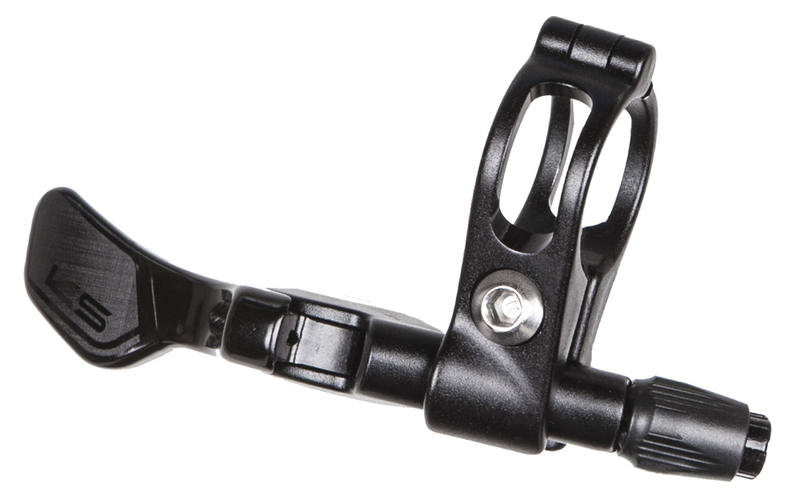 The southpaw will work with any derailleur cable and standard shift housing. This remote requires the post to crimp the end of the cable, meaning the cable must be thread from the remote to the post and will not work with Posts like the Fox Transfer. It uses the same cable and housing as the normal KS remote. It's just a standard shifter cable and housing. Does this works with Giant Contact SL Dropper? BEST ANSWER: As long as the cable head sits in the remote and not the post it will work. Otherwise you will need something to anchor the open cable end at the remote, like the cable collar for the KS Eten. That way you can run the cable backwards. I had it installed at a bike shop. Worked great with my Giant post. This works best with any cable actuated Dropper Post. Will this fit a 31.8 diameter drop bar? Just got a couple of these and the barrel adjusters don't seem to spin. Anyone install these recently? BEST ANSWER: I just installed one. The barrel adjuster does move it is just a bit hard when first adjusting. Mine just tuned counter clockwise to tighten the cable. It was a bit tight at first. Pull the barrel adjuster away from the lever and then turn. Thanks Chris, we were pulling them out but they were tightened up so much we had to put a small wrench on it to undo it. Will this remote work with a fox transfer internal? BEST ANSWER: No this remote uses the cable head instead of a cable clamp. This remote will only work with posts that have a cable that clamps at the post its self. I used this on 2 cable actuated seatpost ( Ks Lev, Azonic Post ) and it worked just fine. All it is a mechanical device that pulls cables in a given manner. No. The KS southpaw lever uses the same cable end as the internal fox transfer post uses at the post. What material is this made from? BEST ANSWER: it is metal with some plastic adjustment pieces. Well made, I've had no problems and actuates so much better than the stock remote. The lever and the mount that attaches it to the bar are metal. The barrel adjuster is plastic. Mostly metal (aluminum). Really sturdy. I have owned two and they havent broken. Will this work on a KS Eten with external cable? BEST ANSWER: Yea. That’s the dropper I had at the time I bought this. Yes. 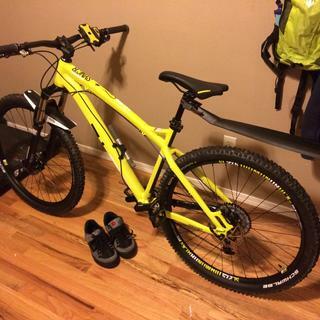 I have that setup on two different bikes. Will this work as a replacement for the RSL remote? (the standard specialized dropper remote) I need a new one really soon! BEST ANSWER: It should work with any dropper/shifter that uses shifter cable. Hope that's the answer your looking for. Does this work with the KS Eten Integra? The barrel connection is different then the cable connection I have. The cable screw in where as this remote looks to be a one turn twist. What cable and barrel do I need? Can someone send me the link? Will this work with a DMN Dropper Post?